Championship teams from all sports are usually invited for a White House visit, and hockey is no exception. 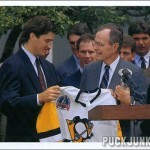 In June 1991, the Penguins met with President Bush. 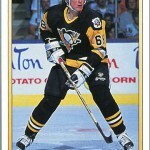 On the front of this hockey trading card is Pens’ team captain Mario Lemieux, presenting a white home jersey to a smiling Bush. In his left hand, Bush is holding a miniature replica of the Stanley Cup. Pictured in the background are Penguins’ players Joey Mullen, Kevin Stevens and Bryan Trottier, among others. 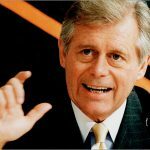 The Pittsburgh Penguins capped their Stanley Cup championship season with a visit to the White House and a meeting with President George Bush on Monday, June 24, 1991. Players, coaches and management assembled in the Rose Garden of the White House where they were joined by the President. 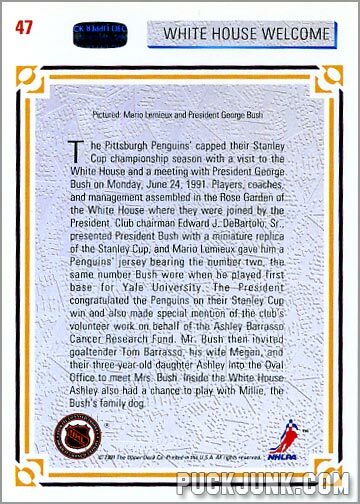 Club Chairman Edward J. DeBartolo Sr. presented President Bush with a miniature replica of the Stanley Cup and Mario Lemieux gave him a Penguins jersey bearing the number two, the same number Bush wore when he played first base for Yale University. The President congratulated the Penguins on their Stanley Cup win and also made special mention of the club’s volunteer work on behalf of the Ashley Barrasso Cancer Research Fund. Bush then invited goaltender Tom Barrasso, his wife Megan and their three-year old daughter Ashley into the Oval Office to meet Mrs. Bush. Inside the White House, Ashley also had a chance to play with Millie, the Bush’s family dog. I wonder if the writer got paid by the word to pen this. “The President congratulated the Penguins for their Stanley Cup win.” I mean, come on! That’s usually what the President does when he invites a championship team over for lunch. 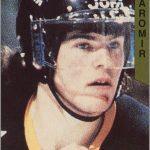 Anyway, it is too bad that nothing interesting ever happens during these White House visits, like Jaromir Jagr being tackled to the ground by the Secret Service after being mistaken for a KGB Agent, or the President puking on Mark Recchi during lunch, or Vice President Dan Quayle suffering a knee injury while playing horseshoes with Ulf Samuelsson. 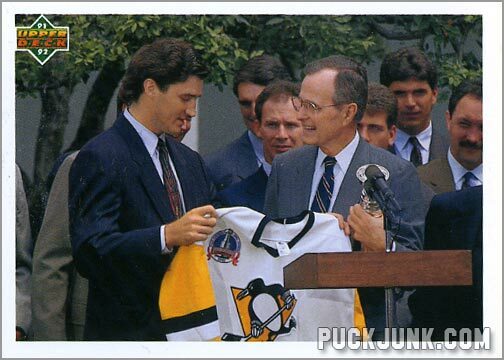 Of course, nothing that exciting happened during either of the Penguins White House visits in 1991 and 1992. Just smiles, handshakes, and playing with the family dog.